We are currently excepting application for all programs! Stop by today for a tour with one of our directors! 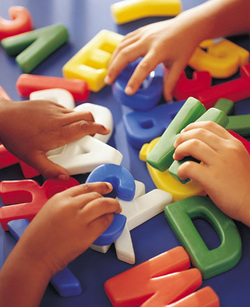 Creative Center Daycare & Preschool takes pride in providing the highest level of care to our families. Our facility is designed to make your child feel comfortable, accepted and confident as they learn and interact with other children. All of our staff have earned their certifications or degrees in early childhood education and have passed all of our strict background and reference checks. We only employ the best teachers and staff to care for our students. All staff members are trained to teach an age appropriate curriculum to all children at every level of their development. Staff retention rate is very high. Creative Center Curriculum - We know that children learn best when they're actively engaged. Children have the opportunity to discover their own special talents and best ways to learn while feeling valued for who they are, while having the guidance and freedom to learn in meaningful ways. We believe that all children are talented, capable and special, whether they enjoy music or math. We know they learn Science, Math, Reading and Writing concepts through hands-on, sensory-oriented activities. Creative Center's unique curriculum gives children the guidance and freedom to construct their own body of knowledge in ways most meaningful to them. Through Creative Center Curriculum, children have access to a huge variety of activities. Discover their own special talents and best ways to learn. Feel valued for who they are. Have the guidance and the freedom to learn in meaningful ways. Develop critical thinking and problem solving. In fact, Creative Center can offer families concrete data on how our curriculum is meeting the educational and developmental needs of the children in its program. Results from a Preschool assessment tool showed that children attending Creative Center made substantial gains in their learning and development and have the educational skills needed for a successful transition into Kindergarten. This assessment tool also assists teachers in developing customized curriculums for each individual child. Creative Center principles follow the guidelines for developmentally appropriate practice set forth by Department of Education and DCYF. Creative Center believes every child has an itch to explore or urge to emote and at Creative Center, that's okay. You see, our philosophy is built around empowering children to learn in their own ways, at their own pace and exploring their own interests. Children feel safe and free to explore and discover in homelike surroundings. Our experienced and caring teachers encourage children to express their ideas and feelings in ways they are most comfortable to them. This allowing the child to deepen their knowledge and free them from the fear of mistakes, as we believe this is how a child learns. Our school's advanced security system and comprehensive hygiene practices help ensure your child's safety and health while providing you peace of mind. Creative Center's system allows our staff instant access to your child's medical information, arrival and departure times, and the names of people authorized to pick up your child. Only authorized personnel are admitted into our building. We have an open door policy for all parents and guardians. We encourage family engagement, as we feel this provides an added value to our quality program. The Motto, "Every Child-One Voice" speaks volumes for our center and the state to strengthen the commitment of early education. We embrace and encourage parent communication, parent decision making and family participation within our center's educational program. You are always invited to share any ideas that you may have to help further enhance your child’s interests, needs and education. Please remember communication is the secret to success pass it on! Creative Center provides and innovative child care service. Experience our center yourself by taking a virtual tour, check out our website, and schedule a visit today!